Spring represents an awakening. Nature is waking from winter hibernation with new life, blooming into a new beginning. Spring is the ideal time for cleansing and rejuvenation. In this workshop, we will focus on Swimming Dragon style of Qi Gong. The Dragon is associated with both strength and flexibility. Spring represents an awakening. Nature is waking from winter hibernation with new life, blooming into a new beginning. 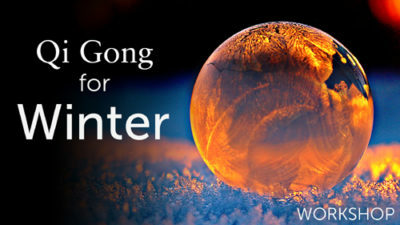 Qi Gong mirrors the flow of nature, keeping us connected to our source. Now is a great time to enliven and awaken our energy, celebrating our physical, energetic and spiritual bodies. Spring is the ideal time for cleansing and rejuvenation. In this workshop we will focus on Swimming Dragon style of Qi Gong. The Dragon is associated with both strength and flexibility. This is a powerful workout and cultivates a healthy, strong body. We will also focus on transformation, letting go of the old and bringing in the new. What do you want to cultivate in your life? What are you inspired to do? How can you best use your creativity for a fulfilling life?